The interview took place when Dr. Chung was collecting research data with MBA students David Carroll and Amy Timo, Carlow graduate Jennifer Bourne, MBA candidate Maniak Mehta, Jewish Community Center teacher Michelle Lu, and University of Pittsburgh PhD candidate Chenjui Su. 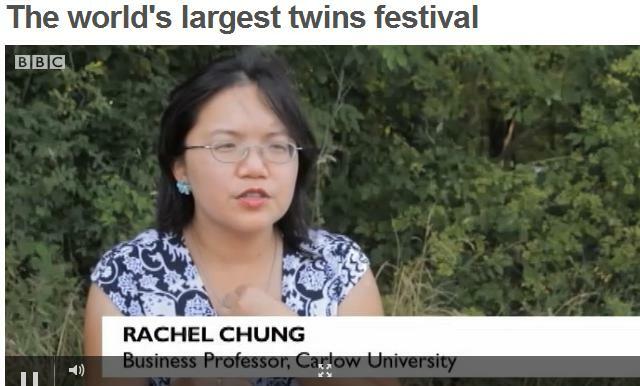 During the festival, the research team collected data from more than two hundred pairs of twins. By comparing behaviors of identical to fraternal twins. Dr. Chung hopes to estimate the heritability of online behavior. including security behavior. This research is a collaboration with Dr. Dennis Galletta from University of Pittsburgh, and is funded by Geibel Institute of Justice and Social Responsibility of Carlow University, Katz Graduate School of Business of University of Pittsburgh, and a $10,000 research grant from the Institute of Fraud Prevention. This research was later on featured by the Brazilian magazine Profissional & Negócios on April 26, 2017 in this article ( in Portuguese). In August 2015, The Friendly PA program of Idea Foundry published an in-depth profile interview of Dr. Chung for their Greater China Initiative. On August 19, 2015, Dr. Chung was mentioned in an article on innovation by David Wu of Cheetah Mobile published United Daily News (UDN), one of the largest newspapers in Taiwan. In September 2015, Dr. Chung was quoted for an article in the Architect Magazine. The Chatham community places a priority on seeing ideas like Kearns’ become reality. That is especially true when it comes to the school’s two-year dual master’s program in sustainability and business administration. Partnering with major business accelerators in the Pittsburgh area, students are learning not only how to create sustainable products but also how to make them viable business ventures, says MBA program director Ting- Ting (Rachel) Chung. In November 2015 Dr. Chung was interviewed by Winchester Thurston students and included in the “From There to Here” program that was on display at the Children’s Museum in February 2016. In May 2016, Dr. Chung was interviewed by Taiwan Macroview TV on differences between Taiwanese and US colleges.